Time to ‘fess up; I know Copland’s most popular ballets – Rodeo, Billy the Kid, Dance Panels and Appalachian Spring – but not Hear Ye! Hear Ye! That’s why I wasted no time in downloading this new release, the second in Leonard Slatkin’s ongoing Copland cycle with the DSO. The first volume – Rodeo, Dance Panels, El Salón México and Danzón Cubano – was well received on these pages; indeed, Brian Reinhart made it a Recording of the Month. Hear Ye! Hear Ye! – its title comes from the preamble to proceedings in a US court – was commissioned by the Chicago-based dancer and choreographer Ruth Page (1899-1991). An influential figure her contributions to contemporary dance were largely overshadowed by those of Agnes De Mille, a topic that Charles Greenwell dwells on at some length in his liner-note. Set in a Chicago courtroom this one-act ballet centres on the murder of a male night-club dancer and the conflicting evidence of several witnesses. The club’s hostess points to a female dancer, the honeymooners swear it was a chorus girl and the waiter insists it was a crazed stranger. In an anarchic twist the jury finds all three of the accused guilty, which satisfies the lawyers at least. The ballet was premiered in Chicago in 1934 and Copland composed a concert suite that was played in New York three years later. Shortly after that he declared the music ‘incidental’ to the dance and withdrew both the ballet and the suite. The energetic, rather jazzy introduction – complete with ominous ‘shots’ – certainly grabbed my attention. The First Dance – strikingly staccatoed, with deliciously brazen brass – is just as arresting, not least because the DSO respond to the music with such alacrity and a winning sense of style. At this early stage it’s hard to understand why Copland spiked the piece, as it has all the verve and vigour one associates with his best-known ballets. The insistent drumbeats as the hostess is sworn in bristle with menace and The Chorus Girls’ First Dance has all the brio and bounce of a big Gershwin tune. Goodness, these Detroiters can kick with the best of them, modulating to something much warmer and slinkier in the First Pas-de-deux. Slatkin springs rhythms with casual ease, yet the playing is as perky as one could wish. The recording is firm and clear, the first re-enactment of the murder crowned with a splendid gunshot. Also, there’s a subversive feel to the writing that wouldn’t be out of place in one of Shostakovich’s satirical scores; also, Copland doesn’t stoop to cliché, notably in his pithy introduction to the honeymooners. There’s some lovely woodwind playing both here and in The Chorus Girls Dance with Doves, not to mention a compelling sense of drama in the Second Pas-de-deux and Murder. The gunshot, although expected, still made me jump. Then again everything about this performance is so immediate, so alive, that one shouldn’t be surprised. This is a ballet, after all, and The Chorus Girls’ Third Dance shows Copland at his jazzy, toe-tapping best. Even that patter of drums – shades of an Apache war dance, perhaps – seems utterly appropriate in this new frontier. Indeed, this scenario, rooted in a city famed for its gangsters, is little different to the lawless milieu of Billy the Kid; indeed, it’s just as violent and arbitrary, which comes through in the work’s more trenchant – and dissonant – passages. Speaking of which, Copland’s distortion of the national anthem as the verdict is announced was criticised at the time. One can only imagine what Joe McCarthy would have made of that un-American gesture, had his committee been sitting back then. As it happens he and Roy Cohn did question the composer in 1953, focusing on his political affiliations and overseas activities. In retrospect it seems inconceivable that someone who gave such eloquent voice to the spirit of America past and present should be treated in this way. Now for my second confession. Preparing for this review I discovered, to my shame, that I own the Oliver Knussen/London Sinfonietta recording of Hear Ye! Hear Ye! (Decca). As far as I can see this is the only alternative version available; trouble is it’s shackled to David Zinman’s somewhat variable Baltimore accounts of other Copland pieces. From the outset it’s clear Knussen’s is a virtuoso performance, quite well recorded. Just as obvious is that he takes a more constrained view of this exuberant score. It has its moments, but alongside Slatkin’s performance it’s not as involving or as idiomatic. In short, no contest. There’s much more competition where Appalachian Spring is concerned, whether it be the suite or the complete ballet. Among the best full-score versions are those by Leonard Bernstein (CBS/Sony and Deutsche Grammophon), the composer himself (RCA) and Michael Tilson Thomas (SFS Media and RCA). The last mentioned, with the San Franciscans in radiant form, is even more desirable in its 2004 remastering. I referred to that recording in my review of the Andrew Litton/Colorado Symphony selection of Copland scores. Alas, Appalachian Spring wasn’t included, but I hope they tackle it at some point. 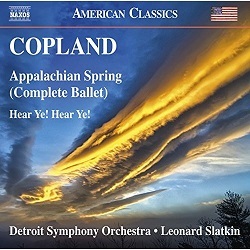 Slatkin’s Appalachian Spring – which begins a little too soon after Hear Ye! Hear Ye! – certainly starts well. The strings have that necessary lustre, the woodwinds are suitably plangent and there’s a wonderful serenity to this sylvan scene that augurs well for what’s to come. This conductor may seem a little dewy eyed at the outset but the leaping dance rhythms that follow are taut and sinewy. The orchestral blend is impressive and the level of detail – especially in the score’s quiet stretches – is quite exceptional. Then I noticed that Soundmirror’s Blanton Alspaugh is listed as producer/editor, his colleague Mark Donahue as one of the engineers (alongside the DSO’s Matt Pons). I was also struck by the spontaneity of Slatkin’s reading, and the way he makes the music sound newly minted. This certainly isn’t one of those moulded, rather safe concert performances that, although beautiful, misses the ballet’s tough, hand-hewn character. This performance - bright and sunny - really is rooted in the great outdoors. That said, Slatkin's also at home in the darkened pit, responding to the demands of his dancers and making the most of those big, expansive climaxes. As for the DSO, they respond to Copland’s gentle interludes with hushed intensity. I’ve yet to hear the first volume in this series, but on the strength of the second I shall seek it out at once. Admittedly I was most interested in Hear Ye! Hear Ye! and assumed – rather lazily – that its well-worn coupling would be no match for the best in the catalogue. In the event I was bowled over not once, but twice. In fact, I’d say Slatkin’s Appalachian Spring is one of the most illuminating performances of this American classic that I’ve ever heard. Bravo, bravo and thrice bravo! A worthy companion to Andrew Litton’s Colorado Copland; augurs well for the rest of this series.